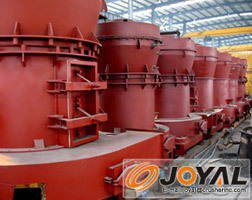 The purpose of the raymond mill is to grind materials in the fields of building materials, mining, metallurgy and chemical industry. The materials must be non-flammable and non-explosive materials such as: limestone, calcite, barite, dolomite, potassium feldspar, marble, talcum, gypsum, kaoline, medical stone, rock phosphate, manganese ore, iron ore, glass, ceram, active carbon,carbon black,fireproof materials, heat preservation materials, chemical materials and so on(300 kinds of materials). The materials should have the hardness less than 7 in Moh’s scale and humidity less than 6 percent. The granularity of the end products can be adjusted from 30 to 325 meshes.